i have been VIRTUAL friends with many dementia folks for years. After 2yrs, i met a few at the huge 2015 ADI Conference in Australia, so i realized that this time i needed to be better prepared for the tremendous excitement of actually meeting others in person. i needed to prepare for adding the personal connection of touch to our friendship (and the cost of that excitement on my own energy reserves). Because i am strong introvert, all these interactions are tremendously outrageously intense and important – but also each interaction COSTS me energy instead of giving me energy. So this time i was ready for the personal friendship excitement. I allowed plenty of personal introvert time before, during, and after the conference. 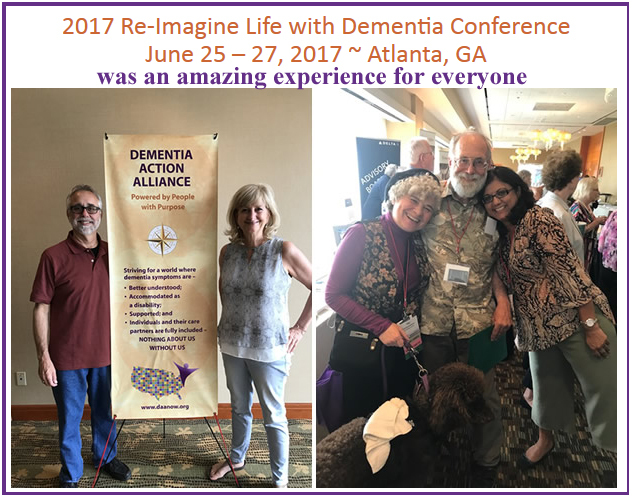 What totally overwhelmed me at the first Dementia Action Alliance conference in USA was the response from persons who were not themselves living with dementia symptoms. In this first small conference i think we had 15 speakers with some type of dementia. The opening and closing Plenary presentations were panels of persons with dementia. Laurie Scherrer and i both spoke on use of Compensation Strategies — another area where our lived experience gives us unique expertise. The entire conference contained other experts, but highlighted expertise from various aspects of lived experience. Just like each of us is still brilliant, but we are brilliant in alternate ways — the education we offered was not the standard fare usually offered by doctors, scientists and other professions. We have alternative expertise from our lived experience. By the closing Town Hall discussion, the people WITHOUT dementia were surprised at how helpful it was to hear directly from the experience of persons living with dementia. Suggestions were overflowing, from how to arrange help for presentation proposals, to methods for financing travel by Persons With Dementia for speaking opportunities. Collectively, the response was tremendously exciting, and individually i was told how my words will have helped many many persons in large facilities in Georgia and nearby states, given suggestions for how facilities could maybe use the many data links i have been collecting from projects by other persons with dementia symptoms, and contacted about speaking in the future. to the folks who contacted me individually for speaking, we (husband and i) suggested they contact DAA about forming a speakers group, and instead helping multiple persons speak. It appears that is exactly what may happen with the possibility of a DAA Speaker’s Bureau. Like some of my friends, i have been writing, and sharing material others have written for more than 4yrs. But many times we feel like we must be mostly “preaching to the choir” and achieving nothing but our own cognitive exercise. Sometimes the purpose or mission seems futile, as far as having folks without dementia thirsty to hear and APPLY the expertise of lived dementia experience — to their personal or professional interactions with persons with dementia, etc. But by that closing Town Hall, i felt invigorated by how much we were able to help during this conference, and the future possibilities of others ready to invest in helping Persons With Dementia help others multiply this learning. Horay ! it is happening, so prepare for mobilization and dissemination; in other words, the scattering of seeds !! * Admin issues: SHARE dementia awareness thru buttons below. Feel free to leave your thoughts in the form of comments, but please filter your comments with truthful loving kindness to all concerned. If interested in receiving notice of future blog postings, subscriptions are available through a “follow” button in the upper left corner (MS Explorer) or lower right (Safari, Mozilla Firefox and Chrome). If there is an advertisement below, I have no control over what is shown. My own full legal name is Truthful Loving Kindness. With the new terminology, my current diagnosis is still Mild Cognitive Impairment, but my neurologist said I am in a unique position for helping because I have “one foot in each door”. Text Copyright 2017-07/09. Tags are advocacy, alzheimers, conference, DAA, dementia, Dementia Action Alliance. 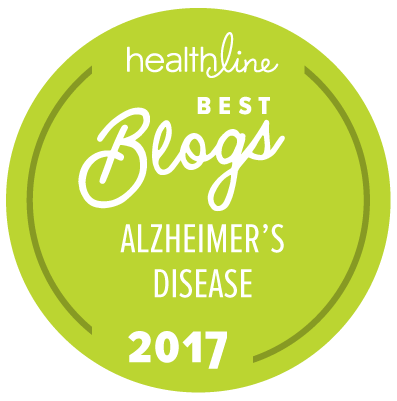 This entry was posted in Action request, Important, Journal, Relationships, Reviews and tagged advocacy, alzheimers, conference, DAA, dementia, Dementia Action Alliance. Bookmark the permalink. I must first say that (finally) meeting you in person was such a joy. You and Guy are are awesome people. Thank You for what you wrote. your eloquent words were enjoyable to read and I’m sure will resonate with all that read them after me. I look forward to our next (face to face) meeting.